I stumbled on one of the books in this trio--not really a series, but 3 books that go together--and had to read them all. Here's my take on the whole set of them. 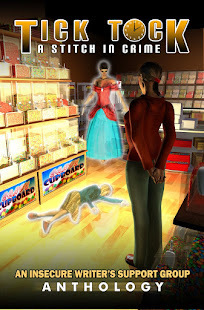 Publication info: Scholastic Canada, 2010 (with a note on Goodreads saying originally published 2000). 154 pages. Scholastic (US) appears to be releasing an edition in 2019, changing the title to Stolen Girl. Stolen from her family by the Nazis, Nadia is a young girl who tries to make sense of her confusing memories and haunting dreams. Bit by bit she starts to uncover the truth — that the German family she grew up with, the woman who calls herself Nadia's mother, are not who they say they are. Beyond her privileged German childhood, Nadia unearths memories of a woman singing her a lullaby, while the taste of gingersnap cookies brings her back to a strangely familiar, yet unknown, past. Piece by piece, Nadia comes to realize who her real family was. But where are they now? What became of them? And what is her real name? This story of a Lebensborn girl--a child kidnapped for her "Aryan looks" by the Nazis in their frenzy to build a master race--reveals one child's fierce determination to uncover her past against incredible odds. 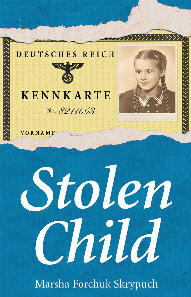 In Stolen Child, Marsha Forchuk Skrypuch introduced readers to Larissa, a victim of Hitler’s largely unknown Lebensborn program. In this companion novel, readers will learn the fate of Lida, her sister, who was also kidnapped by the Germans and forced into slave labour — an Ostarbeiter. 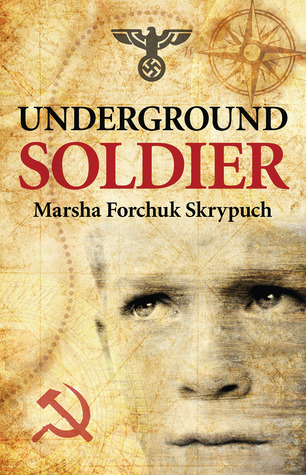 In this exceptional novel Marsha Forchuk Skrypuch delivers a powerful story of hope and courage in the face of incredible odds. Publication info: Canadian edition 2014, Scholastic Canada. 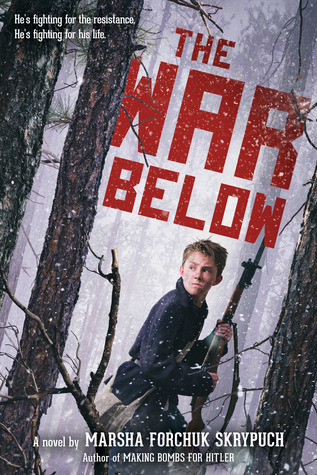 US Edition, 2018, Scholastic Books. 256 pages. This isn't a standard sort of trilogy, because it's not a linear series, but 3 books about 3 characters whose lives overlap during the war. I got hold of them all out of the order of publication, which doesn't really matter, though reading Stolen Child first with no idea of the story (as given away in the blurbs) might make it a more exciting read--where the reader doesn't know any more than Nadia does about her past. Although Stolen Girl is very suitable for younger readers (8 and up), the other two take place in the heart of the war and might be better suited for 11 or 12 and up. 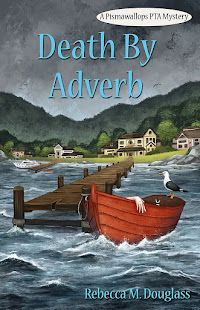 Not that the author gets really graphic about what goes on, but... consider that Luka's story begins with him crawling out from a pile of dead bodies in the back of a truck, and judge from there. They are war stories about children (Luka's age seems fluid, but he's 12 or 13 when he meets Lida, though he seems much older. She is only 9, and also seems much older) who survive by doing and enduring things that seem to this protected reader to be virtually impossible. The author does admit that few children so young were taken in the slave programs, and still fewer were kept alive to try to do the work demanded, so she may have been stretching reality a little. But we do know that young children did and endured extraordinary things to survive the war. The stories are simply written and fast-moving, not so much from crisis to crisis (though that is more true for Luka's story) but just with the progress and the insights each character gains into his or her circumstances. After all, the children don't have any idea at first what has happened or why, or to what degree all civilized rules have been suspended. I appreciated putting all three books together and getting more of the whole story. And it was enlightening, to say the least, to learn about what happened to the Ukrainians during and--worse still--after the war. As with so much children's historical fiction, the books are well-researched and based on actual events we never read of in the history books. These are excellent books, well-written and suitable for ages 11 or 12 and up. Adults will find the stories just as gripping, and we can all learn some history. FTC Disclosure: I checked all three books out of my library, and received nothing from the writer or publisher for my honest review. The opinions expressed are my own and those of no one else. I am disclosing this in accordance with the Federal Trade Commission's 16 CFR, Part 255: "Guides Concerning the Use of Endorsements and Testimonials in Advertising." What an interesting way to do a trilogy. As a kid, I used to read a lot of stories about that time period. These sound like a really different lens to understand this time period. Thanks for reviewing them. Really interesting books—give them a look! Dear Rebecca, thank you so much for your excellent review of my trilogy. Thanks also for noting the typo in the Goodreads data on Stolen Child. It was originally published in 2010, not 2000, so I've requested a change. 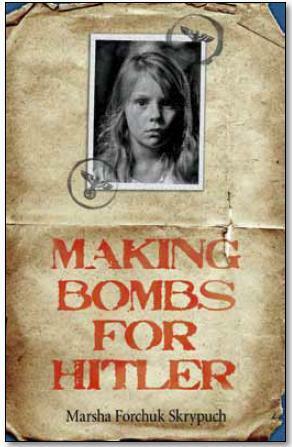 After I finished writing Making Bombs for Hitler, I was able to access first person testimony from kids who had been as age five when they were forced workers for the Nazis. Hard to get one's head around how quickly children must mature when faced with such circumstances. Thank you for coming by—and for writing these books. I learned a lot reading them, and remain amazed how little we really learn in school about the war and the aftermath, especially as it affected anyone besides the US. Five years old...my brain just can’t wrap itself around that.